Adele, Naomi, and I were walking a few blocks from where we had parked to the Minneapolis Farmer's Market. We passed a patch of Comfrey growing in the tall grass along the side of an unkempt building. They both picked some for their Mother's Day boutique (they did "better" later by scavenging fallen blossoms on the ground at the Farmer's Market. And we did buy actually buy a boutique). While waiting for a walk sign at a busy intersection, Adele exclaims "This flower smells like crackers!". I had never smelled Comfrey before; it definitely has a distinct, though not strong odor to it. And I have to agree with Adele, it sort of does smell like crackers. Even though it smells like crackers, I wouldn't recommend eating it. 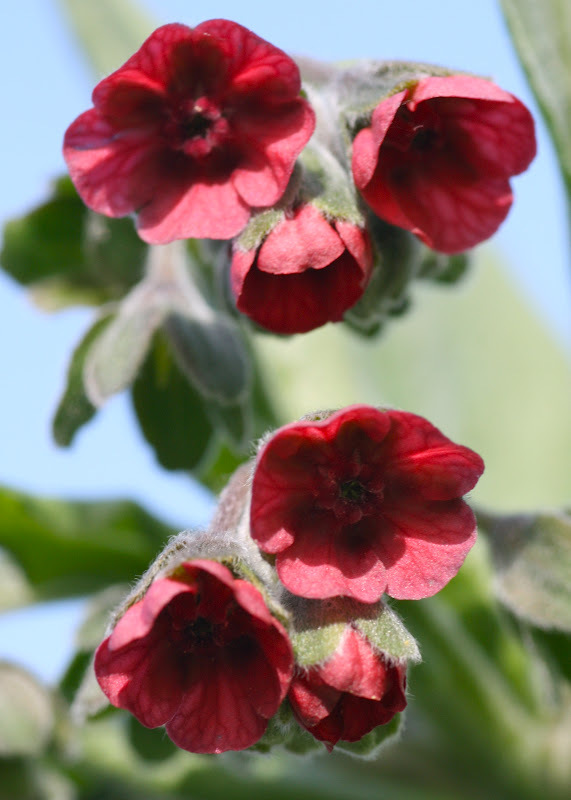 Comfrey contains pyrrolizidine alkaloids which can be toxic in high enough doses. It has a long history of use as a medicinal plant both externally and internally, but because of its potentially toxic effects, not everyone believes it is safe to use internally. It is also an excellent plant to add to compost because its long roots can pull up nutrients that are unavailable to many plants. I find it an attractive flower. The flower stalks we picked quickly wilted and became unsuitable for a "weedy" boutique.